A packed bar is a lot like the prom. You look forward to having this epic night, but most of it is spent waiting in line for one thing or another. It's a problem tailor-made for brand-hacking. 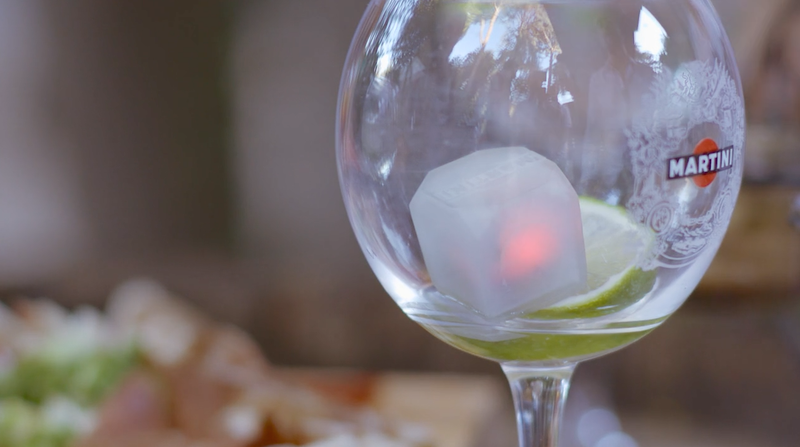 With help from AMV BBDO, Italian alcohol brand Martini has created the Smart Cube, a piece of connected "ice" that tips the server off, via Bluetooth, when your glass hits slurping point. On its face, it's perfect for getting sloshed: The Smart Cubes are marketed as a way for waiters to bring you a full new drink without you ever having to leave your seat … or even ask. If the switchover works as seamlessly as in the video below, you might not even realize you're on your fifth Moscow Mule until you've already become that guy dancing on the table with his bare belly out. Obviously, that's dangerous—even if a restaurant will happily rack up the extra cocktail fees. But Smart Cubes can also be used for making our lives that much less stressful. Instead of giving us a new glass like magic, it could simply work as a practical cue that tells the waiter, "Hey, a bunch of drinks are empty over there. Maybe it's time to pay that table a visit?" Because we're less concerned about finding an empty tumbler under our fingertips than we are about breaking eye contact with our buddies in desperate hope that this is the time a passing server notices our "Excuse me?" face. It's a distracting group game nobody wants to play … especially in Europe, where it sometimes feels like not seeing you is an art form.